Trippy mysticism? Existential self-reflection? This comedy-western animation has it all. Johnny Depp provides the voice for a lizard who takes on the role of sheriff in a frontier town populated by desert animals, good and bad. The graphics are awesome; the characters and dialogue very good; the story clever and tremendous fun. 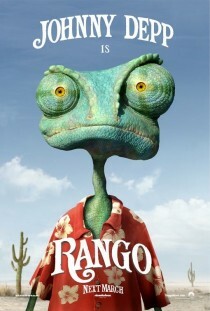 Rango, directed by Gore Verbinski, is a very well put together film. I have seen Rango twice. This is one of the best animated film in recent times. Superb dialogues, amazing animation, cowboys, emotions and the most important thing is the movie theme. Water is such a huge problem in many countries and Rango dealt with it perfectly plus they also have made comment on oil !! Hi Sanand. Yes, there’s a lot to this movie. Really very well written and put together. This is a pretty strange movie to be directed towards kids, but hey, it seemed like it worked for almost everybody who went out to see this. Especially the adults. Good review. I think it works on different levels just as The Simpsons TV series, Dan. It’s very clever how it’s written so that different audiences can take different experiences from the same source material.